The new Issue of the South of the Mountains is available now! Howard Schack, was the third generation in his family to live in Rockland County and work for the family business. His four sons were the fourth generation. Born in Spring Valley, Howard now lives with his wife Ruth in Hillcrest. 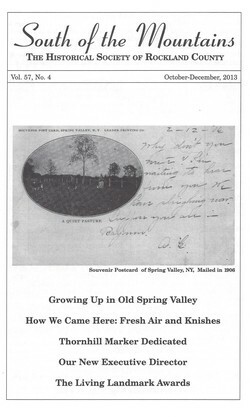 His first article for South of the Mountains, “The Schack Family Business of Rockland County Served the World,” appeared in this year’s winter issue. Ruth R. Schack and her husband made a joint presentation at an alumni gathering at their alma mater, Hunter, College on April 20, 2009. This article, along with Howard’s is an excerpt. Ruth also worked for the family company, Schack Industries, as their director of Human Resources. On the 80th anniversary of the day of his death a marker at the Brick Church Cemetery is dedicated to the memory of Suffern Police Chief, William J. Thornhill, Jr. killed in the active line of duty. Susan Curry Deeks is happily hard at work in her first month as the new executive director of the Historical Society of Rockland County. The editors welcome contribution of letters and articles. Please contact the editors at the Historical Society.